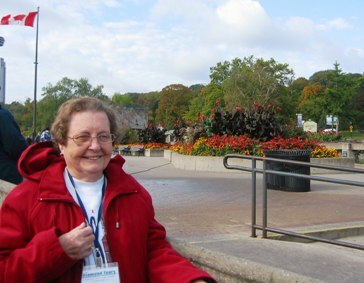 Betty and I signed on to the Oconee County Senior Center sponsored bus trip to Niagara Falls and Toronto Canada from October 11 to October 17, 2009������.. We saw many sights and visited the Falls up close and saw many other places of interest. We took lots of pictures. Betty and I signed on to the Oconee County Senior Center sponsored bus trip to Niagara Falls and Toronto Canada from October 11 to October 17, 2009. The tour left the parking lot at Bell’s at Butler’s Crossing on Sunday morning at 8:00 am and returned at 8:00 PM on Saturday, the 17th. Marian Nolley, Oconee Senior Center Director, organized and led the tour. 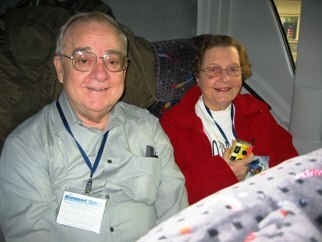 We had 51 folks on board the Diamond Tours bus. While the bus ride was long, we stopped often for breaks and had plenty of snacks on the bus. Many of us knew each other and enjoyed the time together.The group bonded well over the week of riding and touring. The leaves were very colorful in North Carolina, VA, West VA, Pennsylvania, New York and Canada. 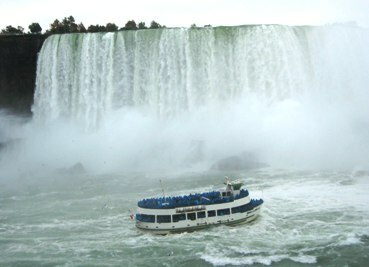 We saw many sights and visited the Falls up close and saw many other places of interest. We took lots of pictures. 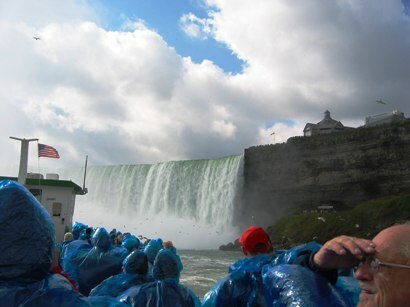 On October 13, we toured Niagara Falls on the Canada side. 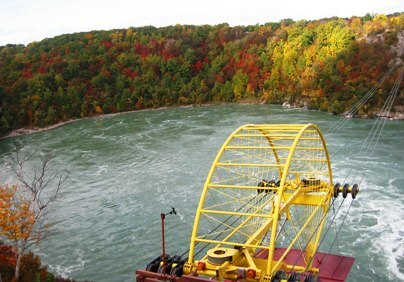 It affords a great view of Niagara Falls in the U. S. and in Canada – the falls are separated by small Goat Island. Our group took many pictures. 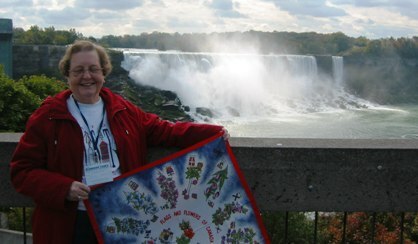 There are many flowers on the approach to the Falls and in the City of Niagara Falls, Canada. There are many Parks maintained by an authority separate from the Government and the Parks are well maintained. We took the Behind the Falls tour. 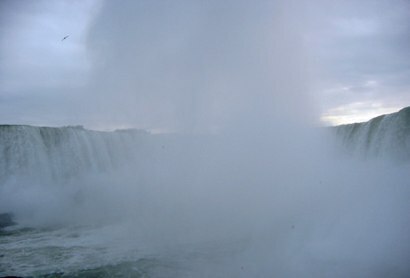 We took the Maid of the Mist cruise to the area below the Falls and saw a lot of misty fog. We needed rain coats for both. 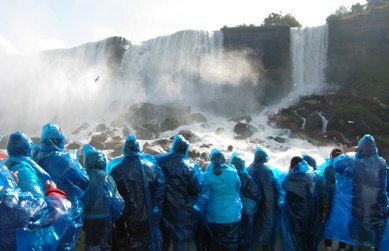 This experience lets you appreciate the size and beauty of the Falls. We learned that 34 Million Gallons of water per minute goes over the Falls. That is a lot of Water! 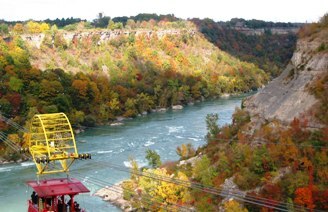 We then rode along Niagara Valley to Niagara on the Lake, an affluent and exclusive area of Ontario. We saw a lot of mansions and nice residences along the way.Surprisingly, the elevation is such that the area has a very accommodating climate and allows for growth of peaches, grapes, apples, pears etc. 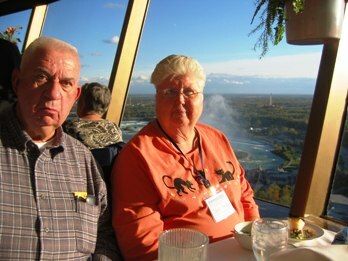 Restaurant with a great view from over 500 feet in height.